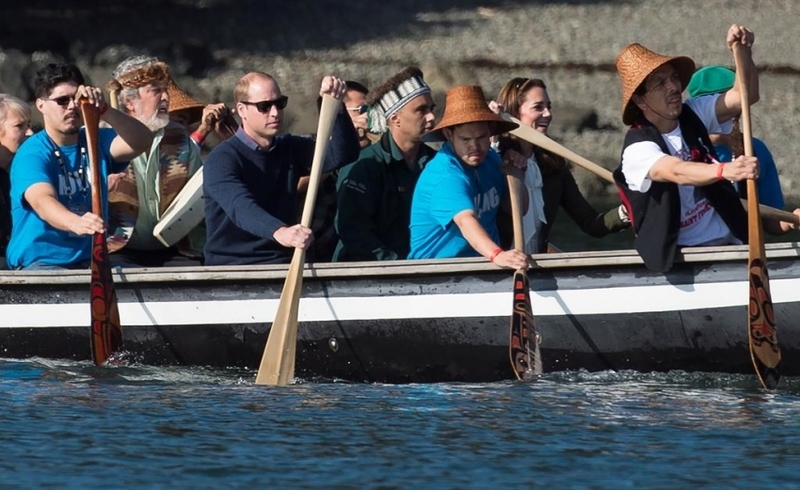 Prince William and Kate paddling a war canoe in Haida Gwaii. Photo by The Canadian Press. Prince William and Kate arrived at a small village off the coast of B.C. on Friday in a replica 15-metre Haida war canoe, ferried to the remote island by paddlers wearing T-shirts opposing liquefied national gas development. Young dancers in brightly coloured and beaded costumes performed a dance for the survivors of Canada's residential schools and their personal journeys. They also did a magical dance that highlighted the many animals that provide spiritual, cultural and life-sustaining sustenance to the Haida. 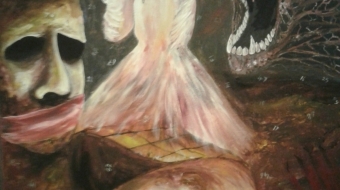 One dancer wore a full bear costume and rose up and roared like a bear during the dance. "We are survivors," Haida Nation spokesman Peter Lantin told William and Kate. "We owe our existence to these islands and these waters. We know that good will come from your visit to Haida Gwaii because you bring hope." "Thank you very much for having us here," he said. "It is an honour for me to be here with you to see your traditions remain strong." Seven paddlers who helped ferry the Duke and Duchess of Cambridge to the Haida Gwaii village of Skidegate wore teal-coloured T-shirts with the words No LNG on them. Some of the dancers who performed wore anti-oil development shirts under their costumes, reading: No pipelines. No tankers. No problem. The federal government gave conditional approval earlier this week to a controversial LNG project that would be built near Prince Rupert on the northern coast of the province. First Nations art and a coastal fishing trip are on the itinerary for the duke and duchess on their final full day in Canada at the remote West Coast archipelago. The duke and duchess visited the Haida Heritage Centre and Museum to learn about the tradition of carving totems as well as other cultural practices. 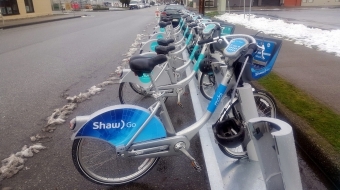 The couple will also tour of the region's new hospital and health care centre, located at the Village of Queen Charlotte. The new facility ensures long-term care and maternity patients can stay within the remote community while receiving health services that previously were only offered in larger cities. William and Kate cap off their tour of the coastal islands with a fishing trip. The area is renowned for offering some of the best salmon and halibut fishing in the world. The islands, located about 100 kilometres off the coast, were known as the Queen Charlotte Islands until 2009 when the province and the Haida Nation reached a historic reconciliation agreement. As a result the island chain went back to its original name. Kate was wearing a dark green blazer by Smythe, a Canadian women's clothing brand.